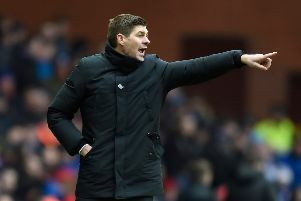 Rangers boss Steve Gerrard admits he cannot defend Alfredo Morelos any more after the Gers striker was sent off again in the 2-1 defeat by Old Firm rivals Celtic at Parkhead. Rangers levelled through Ryan Kent in the 63rd minute and when Celtic defender Dedryck Boyata went off injured in the 74th minute after interim manager Neil Lennon had used all three substitutions, the numbers were levelled. However, in the 85th minute James Forrest drove in the winner to take the champions 13 points clear at the top with seven games remaining. 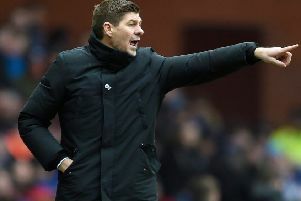 Gerrard, who confirmed defender Andy Halliday had been shown a second yellow card in an unsavoury post-match melee between the players on the pitch, gave a simple reply when asked if he could still defend Morelos. “No. Not no more,” he said. “I have gone above and beyond for Alfredo. “I have continued to protect him, support him and love him as a player and the person he is but I have to draw the line under it now and he will be punished internally. “I will recommend to the board that he is fined a week’s wages and will also recommend that that fine should go to the supporters who came today because they are the ones who will suffer from his lack of discipline, also his team-mates as well. Gerrard promised a tougher approach to discipline within his squad when asked if Morelos could change his ways. The former Liverpool and England captain, who was “very disappointed” with the defeat, said: “That’s a question you will have to ask the player himself. “I am sitting here hoping, wishing. “I can honestly say hand on heart I have done everything I can. “His team-mates have done everything they can, my staff and support staff have done everything they can. However, Gerrard had sympathy for Halliday, who remonstrated with Brown after the Celtic midfielder celebrated in front of the 800 Rangers fans at the final whistle. He said: “I feel for Andy. Celtic are well within their rights to celebrate, they have won a big game and stretched their lead. “We celebrated when we won the last Old Firm game so you are well within your right to celebrate but I can’t understand why a guy decides to celebrate 10 yards away from two per cent Rangers fans rather than 98 per cent of his own support. “So Andy is going in to protect his own people. I would probably have done that one myself.